Just a few days ago, the journal Science chronicled a group of researchers' efforts to measure seismic activity on the ocean floor, an effort that could help with tsunami warning systems and explorations of the earth’s interior. Through their research, seismologists discovered the global network of seafloor fiber optic cables -- which already carry Internet traffic between continents -- can sense even minute changes in motion and act as underwater earthquake detectors. Fiber optics already delivers the fastest, most reliable Internet connections, making communities healthier, more robust and economically viable. This relatively new use of fiber as a "sensing" technology is poised to have even more profound effects for the health and safety of our communities, not to mention the economy. Fiber optic sensing works by measuring changes in the "backscattering" of light in a fiber cable, which happens when the fiber undergoes a vibration, a strain or a change in temperature. In effect, the fiber optic cable acts as a hyper-sensitive trip wire, with attached electronics sending pulses of light to be disrupted whenever something changes in the atmosphere. The applications of this technology are as varied as they are potentially game changing for many industries. Organizations or governments can deploy fiber optic sensing technology over great distances and places where it’s difficult -- or dangerous -- for humans to physically watch over assets and infrastructure. A single fiber optic cable can cover hundreds of miles of roadways, pipelines or borders. And because it works at the speed of light, these sensors can alert watchers to issues before they become costly and dangerous problems. "Distributed fiber optic sensing technology," Mike Hines, chairman of the Fiber Optic Sensing Association (FOSA) said, "is an exciting innovation and essential tool for enhancing efficiency and safety by monitoring vehicular movement, human foot traffic, critical infrastructure and perimeters over great distances, and much more." 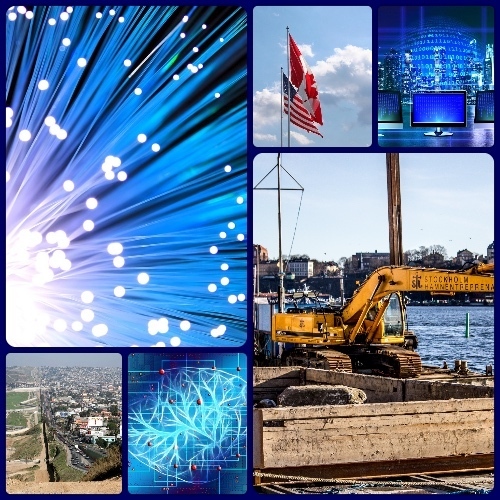 From construction to transit to crisis mitigation, fiber sensing provides value across a range of projects and sectors, protecting our environment, our infrastructure, critical facilities and our borders. And many industries are taking notice: Distributed fiber optic sensor market revenue in the United States has increased every year since 2014. This year’s expected revenue is $188 million, up 31% from 2014. That growth is only expected to increase: by 2025, revenue is predicted to surge 75.9%, reaching $418 million, according to Statista. But while progress in the US is good, the nation risks being outstripped by other countries in its implementation of this nascent innovation. Recently, the Fiber Optic Sensing Association researched deployments of fiber optic sensing technologies around the world. Looking at more than 75 countries and just over 1,300 deployments, it found China had more deployments than any other nation with roughly 11.3% of all identified installations, followed closely by Germany at 9.4%. The US came in third with roughly 6.5%, and South Korea was fourth with 4.8% of installations. This advanced technology can improve public safety, protect the environment, secure critical facilities, make public infrastructure safer and more efficient, encourage economic growth and create jobs. Government and industry can work together to make that happen by recognizing opportunities to promote the use of this technology (as appropriate) and encouraging such innovation. For example, in 2011 and 2016, Congress directed the Pipeline Hazardous Materials Safety Administration to develop standards for pipeline leak detection technology and pursue other actions designed to enhance pipeline safety in the US. In developing nations, many pipeline operators now routinely include fiber optic sensing in new construction to provide warnings of hot tapping, digging and seismic conditions. Argentina, Chile, Colombia, Ecuador, India, Iraq, Kazakhstan, Mexico, Tunisia and Turkey are all home to pipelines running hundreds of miles, all protected by fiber optic sensing. Several American companies have followed suit. These pipeline operators -- and the technology companies supporting them -- need regulators to set clear performance-based leak standards so they can deploy the right technology in the right way. As with broadband Internet delivery, fiber optics are poised to completely change our ways of doing many other things. I can’t wait to see what’s next. — Heather Burnett Gold, President & CEO, Fiber Broadband Association. Follow her on Twitter @FiberMaven or @fiberbroadband.